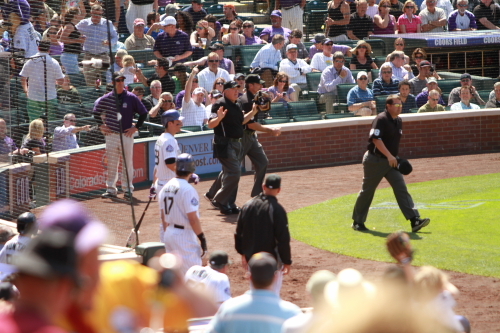 This day at Coors started with one of the most uneventful batting practice I have ever seen. not much was hit to the pavillions. Most of the snagged BP balls were from player toss ups. Instead of heading to the first baseline for autos I hung with the Ranter and Lil’ Ranters. I did manage to head down for a minute or so before the National Anthem. 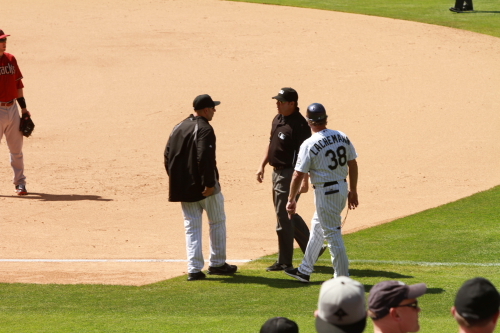 So then headed up to my seats for the first pitch it was a strike to Bloomquist. Nice way to start the game. 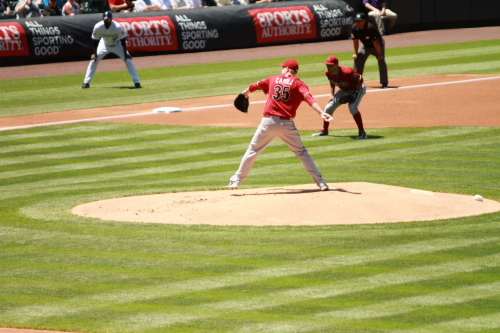 Jorge De La Rosa Throwing the first pitch to D’backs Mike Bloomquist. (yes same view from Opening Day same seat). 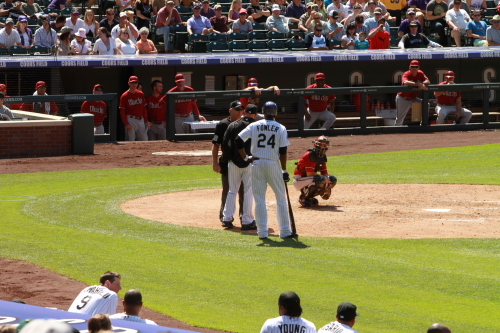 Bloomquist ended up hitting a single and got stranded at second after a Johnson strike out and two flyouts by Upton and Young. 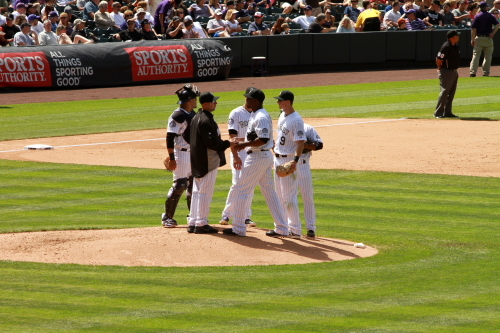 De La Rosa pitched an excellent inning and game. Here are the games starting line ups. You can see Ian Stewart was back in the line up for the Rox. 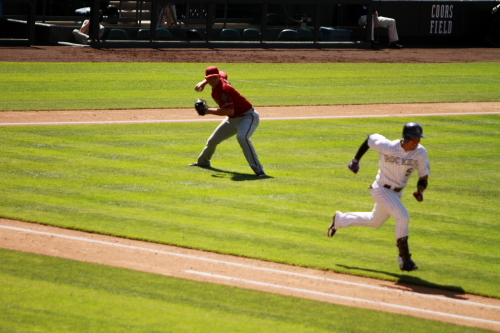 Seth Smith playing rightfield in the first inning. This is for the lady who was sitting behind me in Sec. 307. Told you I would post one for ya. 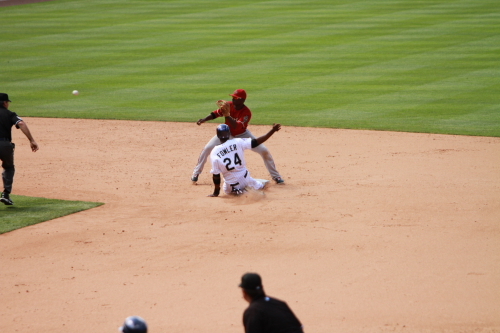 Dex making the catch for the 3rd out of the 1st inning. 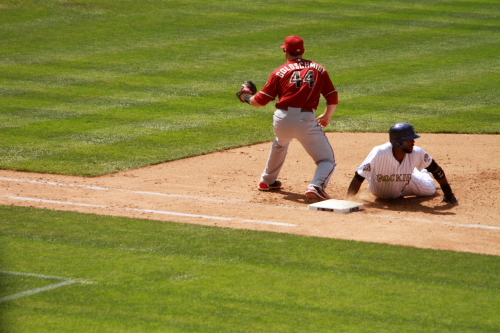 hit by the D’backs Chris Young. 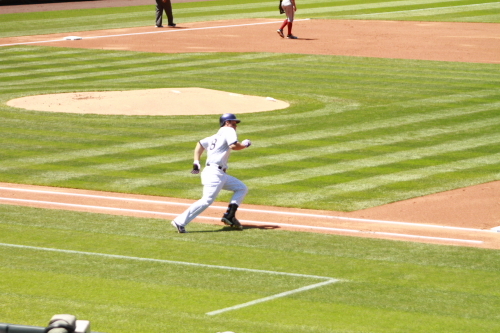 After Hudson walks Fowler, Hmmm deja vu just like on Opening Day Dex lead off walk. Seth Smith is at the plate against Hudson. 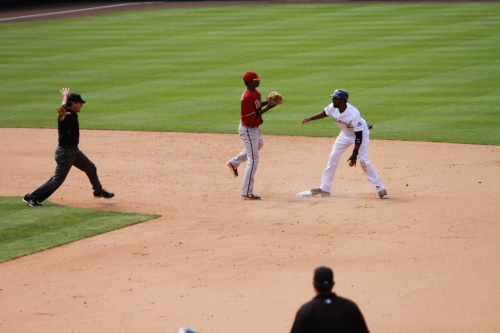 Smith ends up flying out to left, Cargo hits a single and the Deuce hit into a 6,4,3 double play. The Coors Field sunset always a plus for sitting in the upper deck. Their was no scoring til the 3rd when the Rockies Chris Iannetta lead off with a single followed by a Jorge strikeout and scored on a Fowler double. 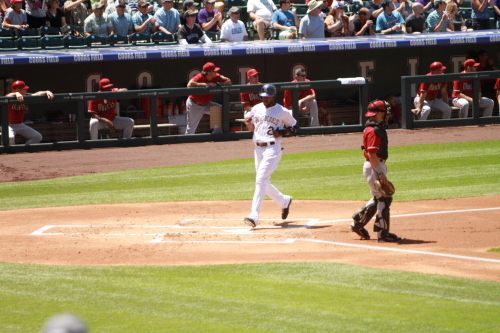 Cargo hit another single and guess who hit into a fielders choice for the 3rd out in the inning. Well refer back to the roster for the answer. 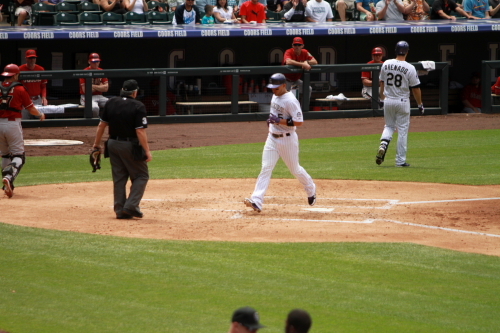 The Rockies scored 2 runs in the 4th with Iannetta hitting a doube scoring Lopez who was at second after he singled and advanced to 2nd on a wild pitch. 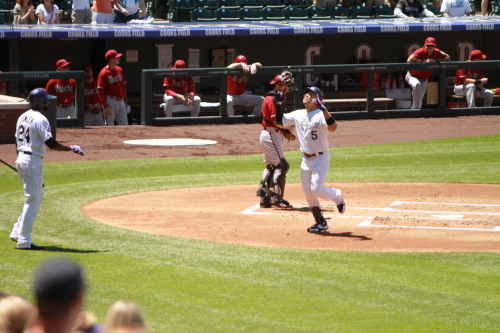 Then Jorge De La Rosa contributes with a single scoring Iannetta from second and the Rox go up 3-0. That was Jorges 14th RBI in his carreer and he now has a better batting average then the Deuce !!!! IMG_3056.JPG<<<<the image ### for the photo that should be here. imagine a photo of Jorge pitching in the 5th taken from centerfield!!!!!!!! Jorge ended up pitching 5 1/3 innings and was removed and replaced with Matt Belise. Jorge had a blister on a finger on his pitching hand and is listed as day to day. Jorge pitched 87 pitches with 3 strike outs and let up no runs. It was a very good outing for him, it is good to see he had his stuff last night hope he heals quick and is ready for his next start. After the 4th Inning I headed to the Rockpile and hung out with Gary X and Allanah X.
Belise pitched til the end of the seventh letting up only 1 hit to his first batter in the 5th and struck out 1. Bettancourt came in the 8th. 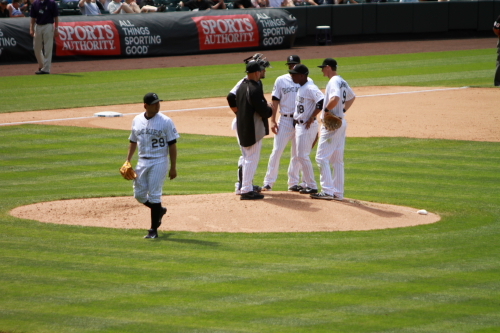 walking the lead off batter Gerrado Parra and then getting the next 3 batters out. 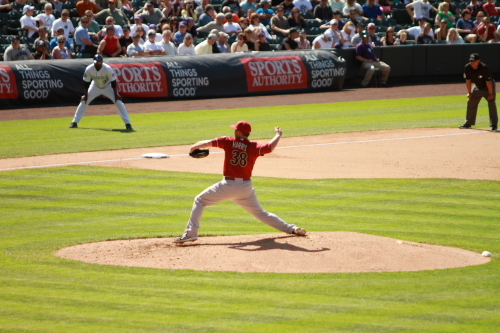 A photo of Betancourt Pitching would of looked great here!!!!!!! I have to Thanx MLBLOGS for sucking!!!!!!!!! 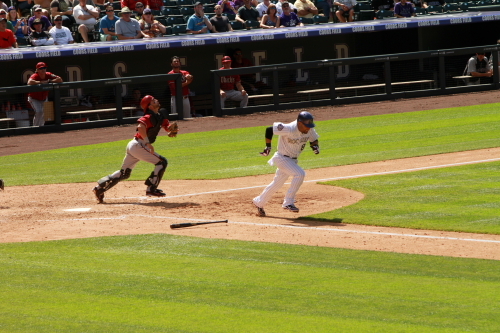 in the Rox 8th this guy snagged a Seth Smith Ground rule Double this is where i would put the Photo of who this guy is sorry no props for you today Robert !!! Photo of the final scoreboard and the celabration after the game at the Root Sports Post game desk!!!!! !ohhh they were great. you must feel like you are being left out thanks to MLBLOGS Sucking ohhh did I repeat myself. Sorry!!!!!!!!!!!! Check back I will add the photos to this game at a later date. 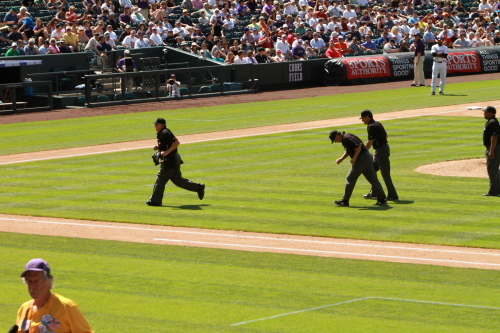 Til then see at Coors on Tuesday. When the Dodgers are in town to play The Rox. 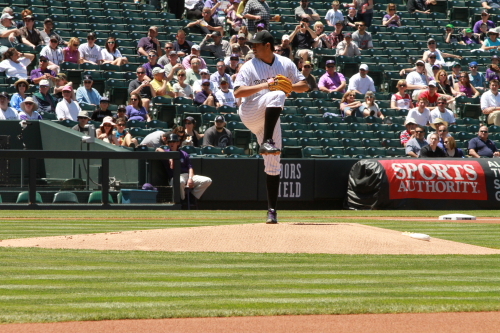 Rox (1-1) Winning Pitcher Jorge De La Rosa Street managed a save. 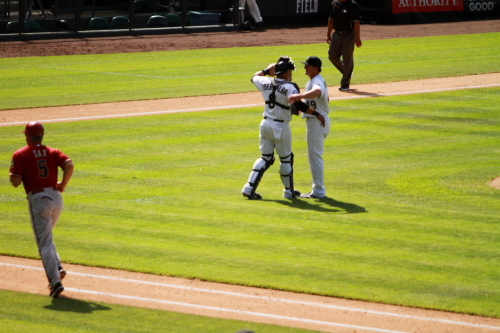 It was also Jorge’s 50th win of his career.